On his second solo album, former Bis-Quits co-front man Will Kimbrough, who fronted the Bis-Quits with Tommy Womack, delivers an exceptional album that travels from acoustic to electric, deliver stunning slow songs and full-on rockers. "Piece of Work" demonstrates Kimbrough's ability to craft a hook-laden, sing-along pop song propelled by the rocking rhythm section, while "Champion of the World" finds Kimbrough serenading you with the drippy lounge. Complete with piano, synthesizers, theremin, and an upright bass, Kimbrough's "Champion of the World" is smoky and rich. A favorable song that makes you wish you were sitting on a barstool, sipping your drink and watching Kimbrough tear his heart out at some hole-in-the-wall place outside of town. Sitting in amazement, you feel as if you're discovering a soul you think has got what it takes to make a career in music. And, for those of you that have been in that position, years ago when Kimbrough was still an up-and-comer, you're in luck, because Home Away proves he not only has what it takes, but shows him doing it. The rest of the album travels through the rootsy pop of "Crackup", the soulful "War of Words", and the laid back "Hey Big Sister". Home Away is captivating, its stunning contrast and exquisite songwriting of unparalleled talents. 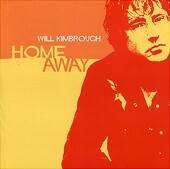 Kimbrough turns simple lyrics into poetry, creating songs that make you feel exactly what he is singing about. And that is the power of music. I'll give it an A-.